This 10 foot black SVGA Cable has two HD15 male ends and features ferrite beads, coaxial construction and double shielding. 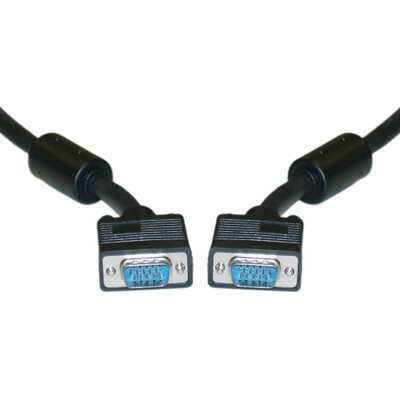 Its primary use is for connecting a computer to a computer monitor for video display. The ferrite beads/cores are small iron oxide alloy cylinders wrapped around the ends of the cable. They are used to suppress EMI/RFI electronic noise on the cable by absorbing the unwanted high frequencies and dissipating them. The coaxial construction and double shielding work to further suppress noise, delivering you the best picture possible. Our SVGA video cables can handle the lowest resolutions used on computer monitors today all the way up to a maximum of 2048 x 1536. Haven't hooked this one up yet, but if it's like the 15 foot one I ordered It will be great!